Fortunate is the individual who, in the pursuit of history, comes upon a document that sheds new light upon an important event. It was through just such a happy set of circumstances that the original receipt for the Gold Spike used to join the Central and Union Pacific Railroads was discovered by Robin Lampson in 1937. At the time, Mr. Lampson was engaged in preparing broadcasts for Wells Fargo Bank on the subject of early California history. One such broadcast mentioning the spike driving incident was heard by Mrs. Henry Edmonds Chandler, a niece of David Hewes, contributor of the spike. A visit to Mrs. Chandler's residence produced the inevitable trunk of family mementoes, and Eureka!—the receipt and other items to excite the adventurer. David (Steam Paddy) Hewes ran a successful land-office and mercantile establishment in San Francisco. Later, with the help of the first steam shovel seen in San Francisco, Hewes leveled sand hills and filled in some of the East-of-Market area. Although financial circumstances prevented Hewes from joining the railroad builders, he had long espoused such a development. Consequently, when the joining was imminent and according to Hewes, "no proper sentiment being expressed by the people of the Pacific Coast ... I felt hurt and mortified that there was no recognition being made of such a great event. At the last moment I said, 'There was one last thing to be done, a last tie and a last spike to be furnished before the great work can be finished." 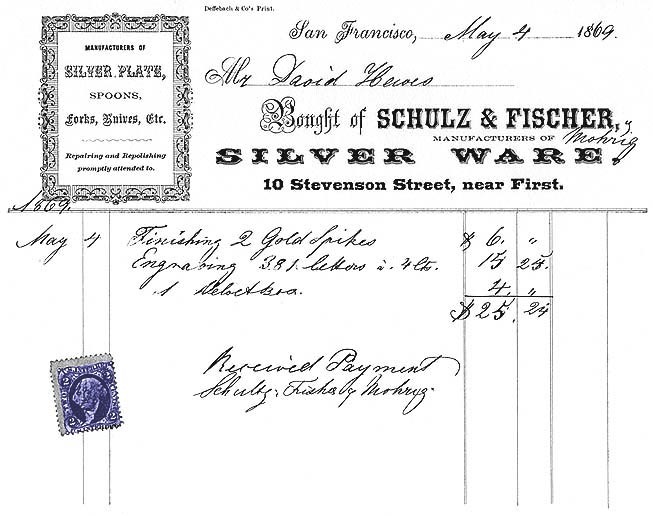 Hewes had a spike with an attached unfinished nugget prepared at Schulz, Fischer and Mohrig. The nugget was to be used to fashion rings and trinkets as mementoes of the event. Apparently Mohrig, the only name correctly spelled, acknowledged receipt of payment. Why the finishing of "2" gold spikes? Did Mohrig count the attached nugget as a second spike, or were two finished? Sufficient evidence exists to give credence to the possibility that another spike was prepared, for a purpose lost to history. 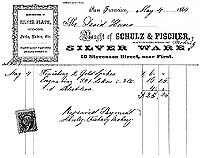 The receipt was given to Wells Fargo by Mrs. Chandler, and when the gold spike was returned to Stanford University after many years on exhibition in the Wells Fargo History Room, the receipt came with the spike and is now in the Stanford University Archives. This is Number Six of twelve Keepsakes issued during 1969 to its members by The Book Club of California in commemoration of the centennial of the transcontinental railroad. The series has been edited by David F. Myrick and designed and printed by Lawton and Alfred Kennedy. The receipt is reproduced through the courtesy of Stanford University. Ralph Hansen is Stanford University Archivist.